Some, including the NITI Aayog chief, have slammed the Congress party of fiscal imprudence in proposing minimum income guarantee, or NYAY, of Rs 6,000 per month to 20 per cent poorest households. The estimated Rs 3.6 trillion payout looks prohibitive. However, a closer inspection of the proposed scheme and current political dynamics make it eminently workable. To begin with, Congress does not intend to implement it as soon as it comes to power, that is if it does, on May 23, 2019. Experts in the party, which include Manmohan Singh and P Chidambaram, who were helped by its data analytics chief Praveen Chakravarty in putting together the scheme, have proposed a new committee that would be constituted to steer the implementation of the scheme. Such a committee would run pilot projects for at least two years before starting to implement the scheme in phases. It will start with taking up the poorest decile of the estimated beneficiaries among the 50 million families, and gradually go up the ladder. Some have pointed out that Congress has already promised a farm loan waiver if it forms the government, and NYAY would become an additional burden on the exchequer. However, most big states, including Congress and BJP run states, have already waived farm loans. These include Uttar Pradesh, Maharashtra, Punjab, Karnataka, Rajasthan, Madhya Pradesh, Chhattisgarh and Tamil Nadu. State governments in Telangana, Odisha and West Bengal have proposed, or already launched, minimum income support schemes for farmers. Therefore, the cost of any farm loan waiver would not be substantial. Moreover, Congress has proposed NYAY as a ‘federal scheme’, possibly 60 per cent given by the Centre and 40 per cent by respective states. 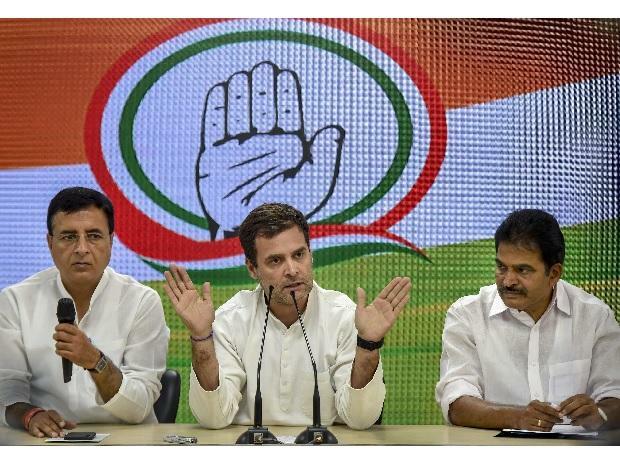 The Congress on its own, or along with smaller parties, currently runs governments only in Punjab, Rajasthan, Madhya Pradesh, Chhattisgarh, Karnataka and Puducherry. It could ensure implementing the scheme only in these states in the first phase, and those other states ruled by its allies at the Centre. It could take up the BJP ruled states in the last phase, or promise the scheme closer to their respective Assembly polls, particularly Uttar Pradesh, which is scheduled for polls in 2022, and where the Congress wants to regain its lost ground. According to the Congress think tank, its government would need to fund these schemes by diverting money from other social welfare schemes. Scrapping its rural employment guarantee scheme, or MNREGA is anathema to many in the party. In any case, as leaders in the party point out, MNREGA is different from NYAY as it is a demand driven scheme. Therefore, MNREGA is likely to continue. A Congress government at the Centre could subsume some of the smaller subsidies that the poorest get, like old age pension. It could bring changes in the Right to Food Act, by raising the per kg price of foodgrains the poorest get. The Narendra Modi government has allocated Rs 1.84 trillion on food security for the 2019-20 Budget, and some of it can go towards meeting the funds required for NYAY. Congress expects NYAY would boost demand and growth that would increase government revenues and help with funding the scheme. The scheme could help FMCG and motor vehicle companies, as MNREGA did when it put more money in the rural economy and boosted sales of FMCG companies. To ensure that beneficiaries do not spend the allowance on liquor, the Congress plans to deposit it every month in the bank account of the woman head of the family, and not the male.